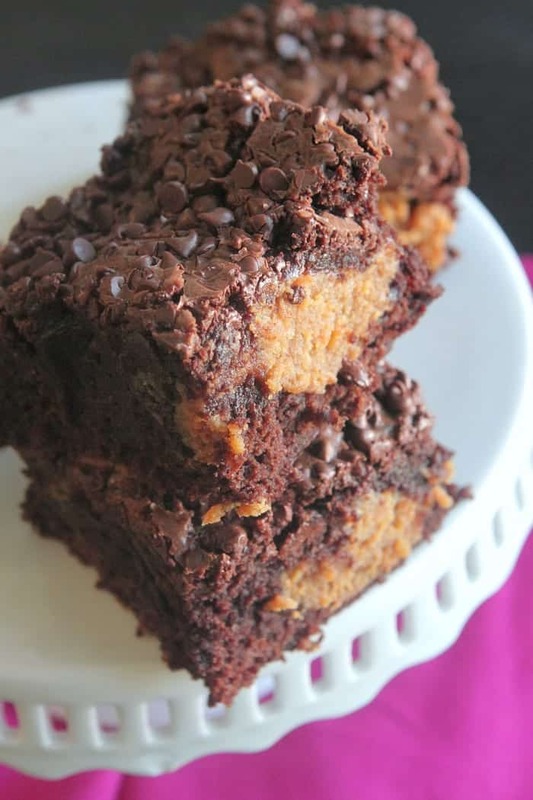 My Peanut Butter Fudge Stuffed Brownies are jaw dropping gorgeous and delicious. 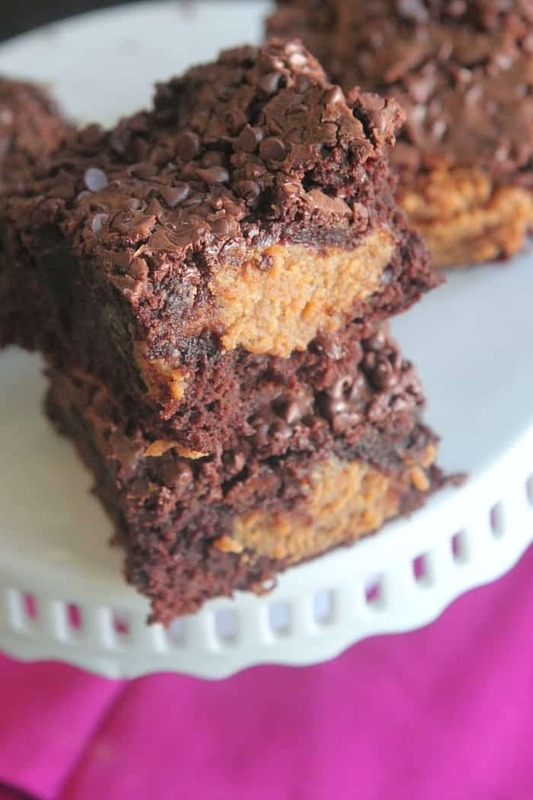 You are in for such a treat with my Peanut Butter Fudge Stuffed Brownies! 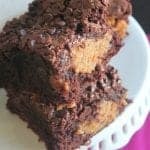 Be sure to try my One Bowl Chocolate Chunk Brownies too! Follow Picky Palate on Instagram for sneak peeks on what’s coming next to the blog! I made you another fun step by step video to show you just how easy this recipe is. So excited for you to try these! Hope you enjoy. Place brownie mix, eggs, oil and water until well combined. Pour half of brownie batter into baking dish. Place peanut butter and sweetened condensed milk into a medium bowl, mixing until smooth. With cookie scoop, scoop peanut butter fudge over brownie batter. 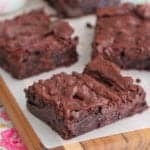 Top with remaining brownie batter. Bake for 50-60 minutes, until baked through. Let cool completely then cut into squares. Serve room temperature or warm. Disclosure: Eggland’s Best provided the eggs for this post. All thoughts and opinions are 100% my own. Thank you for supporting the brands that make Picky Palate possible. Do you add the mini chips before or after baking? You add chips before baking. I have some serious heart eyes right now. These brownies look incredible! I’m going to need to make these soon. Chocolate and peanut butter is one of my favorite flavor combos. These brownies look oh so decadent! Ce n’est pas gentil :/ avec le régime que je fais je ne pourrai manger ça que le weekend, je dois donc attendre !! 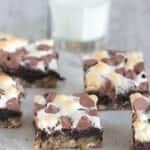 These look amazing, but at what point did you put the mini chocolate chips on these brownies? Was it before or after baking? I can’t wait to make these. Holy decadence! This will be great for our next cookout! Thank you! Made for my gardener and another pan for the local firefighters!! Made this and an oh man did I earn points. cartierbraceletlove Não está dando para baixar pelo Chrome oq eu faço ? cartierbraceletlove I would like to try the cornflake baked chicken and I had an idea for a rice krispie birthday cake. This looks delicious! I definitely will try this for dessert! Love this recipe. Second time I’ve made it. Very quick and easy!! If you haven’t realized it yet from the questions, the recipe doesn’t say when to add the chips. In your video it looks like you had a bowl of chopped peanuts next to the chips. Was that just for the photo? Got a batch in the oven right now for some discerning triplets. Will send their critique later! Passed the triplet test! I used a much smaller scoop for the peanut butter. It’s the size I use for making cookies; like the size of a melon ball. This left me with quite a bit of filling left. Not to fear! Mixed it with a stick of softened butter, 3/4c brown sugar, 1/4 granulated sugar, 2 t. Vanilla, & 2 large eggs. Once creamed together added a mixture of 2 c flour, 1/2 t baking soda, 1/4 t salt. Once that was all mixed added 1 1/2 c. Old fashioned oatmeal and a pkg of choc. Morsels. Mine happened to be mint. Mixed that all together. Dropped cookies ((using my sm. 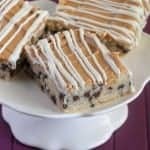 Scoop) onto cookie sheets with baking sheets. I put in a 350 oven for 12 mins. Good! I also took a good portion of the dough and spread in a 9*13 pan to make bar cookies.